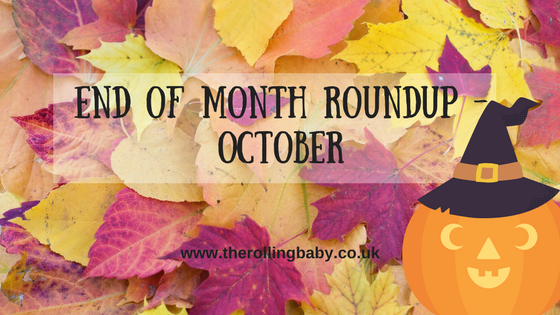 October has flown by, but we’ve managed to squeeze in a lot of different activities this month. My other half had a week off, so we took a trip to Colchester Zoo which was a great day out. It was also my first birthday as a mummy and I had a nice, quiet, relaxing day. We’d also planned to take little one to soft play, but when we got there there were toddlers in the under 1’s area and I was concerned little one would get trampled on, so we left sharpish. My family live in the same town as us, however my other half’s family live just over an hour a way. During my other half’s week off, we took the opportunity to go and visit them. We stopped in their local town first, which is much better than ours, and the car parking is cheaper and did a bit of Christmas shopping, before visiting little one’s grandparents and great-grandparents and having dinner with them all. Little one is almost 6 months old (!) which means I’m half way through my maternity leave. I can’t believe how much she’s changed in the past 6 months. This month we started weaning and you can read about her weaning journey and find out what foods she’s been trying here. She’s ready to start crawling and I’m sure she’s going to do it any day now. I’ve bought a baby play pen for when I’m at home on my own with her so that I can nip to the loo safe in the knowledge that she’s safe. She can roll from one end of the room to the other so quickly, so I’m sure she’ll crawl just as fast, if not faster! I’ve found I’ve got so much to write about and a couple of weeks this month I’ve posted everyday. Some of my most popular posts this month have been my Vegan Banana & Chocolate Cake Recipe, my Baby Girl Autumn/Winter Clothing Wishlist and my Why I Love Dorset – Part 1 review. Just after my birthday, I decided I needed to lose weight and I’m going to do it seriously this time rather than cutting out a few food items here and there and squeezing in a fitness DVD as and when. I’m counting calories and sticking to a set amount each day, I’m doing fitness DVDs three times and I’m walking as much as I can. It’s only been a couple of weeks, but I’m feeling so much better for it already! I’d love to hear about your month and what you got up to – please let me know in the comments section below.